Mice are pesty little rodents that can multiply rapidly. Hiring an exterminator is one way to deal with a mice problem. Another way is to bait and trap the mice yourself. Before you can set your plan in motion to catch the mice, you first have to determin if you have them. Do you have small round holes in your food containers? Do you have small round holes in your walls? Do you hear the sound a little feet scampering in you walls, attic or basement? Do you have little black dropping that look like dark rice? If you answered yes, then you probably have mice in your house. If you are not sure if you have mice, perform this simple test to find out. Sprinkle some white flour where you think you might have mice. Whait a few days and then check the flour to see if there are tiny mouse tracks on it. Walls, boxes, basements, attics, crawl spaces, weeds and shrubbery are among the place mice like to hide. Mice can enter your home through doors, windows, holes, sewer lines, and through holes in the plumbing and gas lines. Mice have two main meal times, which are just before dawn at at dusk. Mice droppings look like little dark pieces of rice. Mice will re-enter if allowed, so be sure to take steps to seal up the holes. Warning: Never touch a dead mouse. Use rubber gloves and tongs. Place the dead mice in a bag and seal tightly to trap parasites. Mice are smart. You don't want to leave a human smell on the trap or bait. Use rubber gloves when setting mouse traps and bait. Wash the gloves with soap and water and then rub a little vegetable oil on them. Set your traps where you find mice droppings. Set the mice traps about 6-10 few feet away from each other. 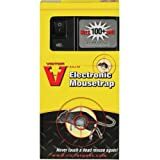 Place the baited end of the mouse trap closest to wall or mouse hole. Set the bait. You can use foods, such as cheeses, walnuts, breads, and dried fruits or use non-food items that mice collect, such as twine and string. Mice are smart and some know how to retrieve the bait without springing the trap, so be sure to secure your mice bait firmly on the trap. Use a homemade mouse trap if you want to capture mice without harming or kiiling them. To make a homemade mouse trap, place a deep stainless steel bowl on the ground. Rub butter or oil along the inside of the bowl. This will make the bowl too stippery for the mouse to escape from. Place some bait in the bowl, such as cheese or nuts. Add a wood ramp leading up to the bowl so that the mouse has a way of getting to the bait. Sticky traps are sticky paper like traps with glue on them. When a mouse walks on it, it gets stuck and can't escape. You just slip these traps right up underneath your cabinets. Poisonous mice traps are not recommend because they can cause harm to humans and house plants. You should not use poisonous traps if you have a baby in your home. 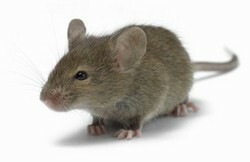 Another reason why you might not want to use poisonous traps is because it may take a day or two for the mouse to day. This would allow the mouse to crawl back in the hole, which means it will be harder for you to retrieve and dispose of the mouse. If you don't want to mice set traps then you can enlist the help of natural predators, such as cats. Sometimes the mere presence of cats is enough to scare the mice away. Cheap ways to improve your home's curb appeal. Cheap and simple do it yourself projects that will improve the outside appearance of your home. Any tips for keeping mice out of cars? I can't really block up holes in an auto. Ralpapajan, I prefer nature's way of taking care of the mice too, with the cats and dogs. Mmmm. I prefer the natural way. We have always had cats and never had mice. Good read - I personally never considered using anything other than normal mouse traps. However I avoid the wooden ones - I found some awesome plastic traps that have a much wider trigger area around the food, so the mouse cannot get to the bait without setting off the trap. I caught three mice in 12 hours with one of those traps! Our cats are great at getting rid of mice. Not that I like it, but when we do get a random one in the house, it's fun to watch them play with them. They fight over the toy and play "keep away". The best way to get rid of mice is to figure out how they are getting in the house in the first place. We can thank the chipmunks we had last summer for helping us figure that out. We plugged up the hold and haven't had any in the house since.